That’s a pretty general statement, and depending on who you ask it’s either an unfair assessment of the government or the understatement of the century. But for the UK-based Economist Intelligence Unit (EIU), it’s only a category given to the country in its annual Democracy Index, which measures the level of democracy experienced in 167 countries. “Flawed democracy” is the title they give to countries that have an index between six and eight, with 10 being the highest possible score and signifying a very good quality of democracy. The Philippines scored 6.71 for 2018, the same score it received in the previous year. In fact, it received the exact same scores in all five categories measured in the index for 2017 and 2018, namely electoral process and pluralism, functioning of government, political participation, political culture, and civil liberties. However, its global rank declined two spots, which now makes it the 53rd most democratic country in the world. It was also surpassed by Malaysia as the second most democratic nation in Southeast Asia, with Timor-Leste remaining on top. Overall, the country with the highest democracy index was Norway, with a score of 9.87. Neighboring countries Iceland and Sweden complete the top three. On the other end of the list is North Korea, with its 1.08 index being the lowest of the 167 nations. Joining it at the bottom three are Syria and the Democratic Republic of Congo. 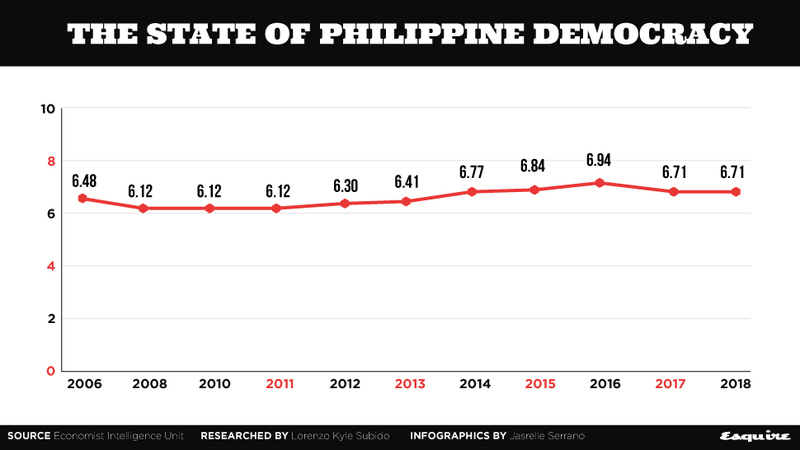 While it’s tempting to label the Philippines’ quality of democracy as static and leave it at that, the EIU did highlight something in the report that may sour that reading. In analyzing the overall improvement of democracy in Asia and Australasia for 2018, the EIU mentioned that while there is progress, there were several countries that “dampened” that improvement. There’s not much else EIU says beyond that, but it did say that these dampeners serve as “a reminder that there is still a long way to go for democratic values to be entrenched in Asia.” And with Asia and Australasia experiencing a slight but still notable improvement in its quality of democracy in 2018, the country’s stagnation may not be a cause for celebration. So once again, the Philippines is a flawed democracy. And it’s just as flawed as it was a year ago.